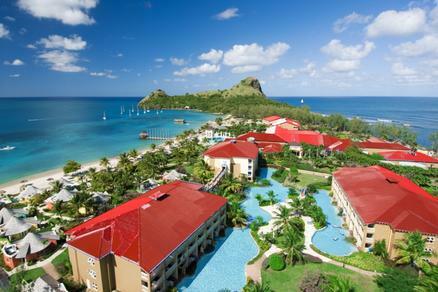 Sandals Grand St Lucian Spa and Beach Resort, St Lucia 5.0 out of 5 based on ratings. 1 user reviews. There are 301 rooms and suites in different categories. This is the newest of the Sandals resorts in St. Lucia and is geared towards romance as an adult-only resort, with amenities like two person hammocks, two person lounge chairs, privacy shades, 2 person massage rooms, a heart shaped pool, and a lot of space for private moments. Activities are available day and night. The pool area and beach has several options for beach and poolside fun with a lagoon pool encircling a central sundeck sprawling 100 yards on the Atlantic side; a Romanesque pool with inset 30-person spa tub, featuring a 350-degree swim-up bar; an activities pool pairs with a sunset-view 16-person spa tub, and a heart-shape pool features a deck with double, cushioned, teak lounge chairs beneath fold-up shades and a 10-person spa tub. Sandals Grand St Lucian = Incredible!! !